Shell Eco-marathon challenges teams of students to design and build ultra energy-efficient vehicles to travel the furthest on the least energy. It is an annual event that takes place in the Americas, Europe and Asia. The competition is split into two classes: the Prototype class focuses on maximum efficiency, while the UrbanConcept class encourages more practical designs. Cars can be powered by conventional petrol, diesel, fuel made from natural gas (GTL), biofuels, hydrogen, solar or electricity. In May 2013, students from Lycée La Joliverie, France, achieved the equivalent of 2,980.3 km on a single litre of fuel with their self-built car – enough to drive from Rotterdam to Athens. They were competing in Shell Eco-marathon Europe, held in Rotterdam, the Netherlands, and attracted an audience of more than 50,000 in a week. 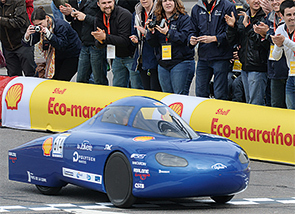 Student teams set five all-time records during the Shell Eco-marathon Europe – four in the UrbanConcept class and one in the Prototype battery-electric category. The Eco-marathon events around the world are designed to encourage debate about the future of mobility as well as including educational attractions for children and students, like the Shell Energy Lab. Other activities included public debates on the future of energy challenges, including the growing pressure on energy, water and food. In 2013, Houston, USA, received more than 1,000 student entrants from across the Americas and vehicles competed on city streets.